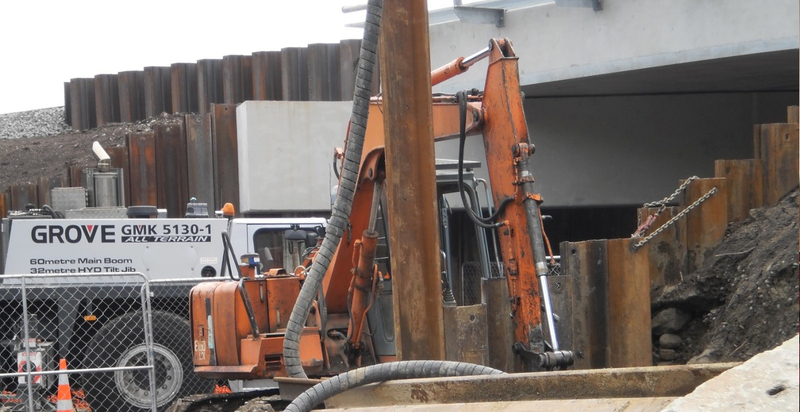 Christchurch High Court - Sheet piling - Acoustic Engineering Services provides measurement, design advice, and expert evidence in the field of acoustics and noise control. The management of construction and demolition noise in and around an operational courts facility provides a unique challenge. However Senior Acoustic Engineer Tracy Hilliker describes how the team enjoys this type of challenge – “Like many buildings in central Christchurch, the High Court building experienced significant water ingress into the basement during the earthquake events. Portions of the building were to be demolished – however the majority of Court Rooms were relatively undamaged, and Ministry of Justice needed to keep using these spaces, given how many other Court facilities in the region were unusable”. The proposed methodology for dewatering and waterproofing the basement required sheet piling around the entire building perimeter – all while Judges (accustomed to being able to control every aspect of the Court Room) continued to hear cases. Night time work was also considered – however sleep disturbance effects for neighbouring central city residences then also needed to be addressed. AES undertook detailed noise and vibration analysis to determine which areas of the building would be most affected, and developed mitigation and management strategies to allow as many of the Court Rooms to continue to be used as possible. Expected levels received offsite were also calculated, and strategies developed to enable work to be carried out for as much time as possible, without exposing neighbours to unreasonable noise. AES were also responsible for the acoustic design of the temporary courthouse constructed on Cambridge Terrace, and were called in to help address acoustic issues which arose when the Nga Hau e Wha Marae on Pages Road was also temporarily used as a Court Room.